The Lord of the Rings: The Battle for Middle-earth II: The Rise of the Witch-king is a real-time strategy video game published by Electronic Arts, based on the Lord of the Rings film series based on the book, directed by Peter Jackson. 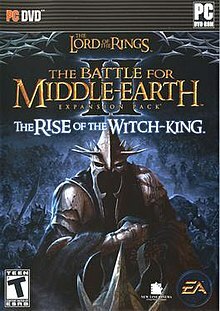 The Rise of the Witch-king is the official expansion to The Lord of the Rings: The Battle for Middle-earth II, which was published by the same company and released in 2006, for Microsoft Windows. The Rise of the Witch-king was shipped to stores in the United States on November 28, 2006 and was officially released on November 30, 2006. The campaign allows the player to command the army of Angmar from its foundation and early attacks against Arnor, to the destruction of Arnor at the battle of Fornost. An epilogue mission allows the player to command the forces of Gondor and the Elves as they invade Angmar in retaliation for destroying Arnor. The story for The Rise of the Witch-king draws a great deal upon the Appendices at the end of the Return of the King to form a basis for the conflict between Arnor and Angmar. Many of the notes that Tolkien made regarding the war are used as missions in the games campaign and epilogue. Although the game closely follows Tolkien's writing, some events are modified to suit the gameplay (such as the palantír of Amon Sûl being destroyed rather than brought to safety at Fornost), or are omitted altogether (such as the flight of King Arvedui from the defeat at Fornost). According to the Guinness Book of World Records Gamer's Edition, this game has the longest title in expansion packs for video games ever. The game features a new faction, Angmar, bringing the total number of playable factions to seven. It also comes with a new campaign based on Angmar, consisting of eight missions telling the rise of the Witch-king of Angmar and the fall of the kingdom of Arnor. New units were added to all six existing factions, as well as both new and improved buildings and heroes. Every faction except Angmar also received an elite hero unit. Elite hero units have a small amount of health and deal a large amount of damage, but there are a small number of them in each battalion, and they only replenish their numbers at a healing structure. Major improvements were made to the War of the Ring mode, including army persistence from RTS mode to the World Map, the introduction of an economy to the World Map, and the introduction of siege weapons to the World Map. Fourteen new territories and battle maps were added, as well as a new region, the Forodwaith. Four hero armies were also made available per faction. The Rise of the Witch-king also added two new historical scenarios for the War of the Ring mode, including the Fall of Arnor and the War of the Ring. Create-A-Hero mode added two extra troll races, new weapons and armor customizations. Heroes were given a cost system tied to the number of powers given to them. Due to a license expiration, EA has shut down the online server as of January 2011. Today the community has moved to a new server through the downloadable program 'Game Ranger' where previous EA and new players continue to host & play on the official EA 2.01 patch. The campaign tells the story of the fall of the Kingdom of Arnor at the hands of Angmar and the Witch-king. For the sake of gameplay, however, many liberties are taken from Tolkien's work and the film trilogy by Peter Jackson. These liberties involve the creation of several characters specifically for the games campaign, such as Morgomir, the lieutenant of Angmar, as well as the naming of an unnamed hill-chief that appeared in Tolkien's writing. Unlike The Battle for Middle Earth II, there is only one campaign which is composed of eight missions which each focus on a distinct battle between Angmar and Arnor, as well as an epilogue which concludes the campaign. The player has the choice of playing each mission on either an easy, medium, or hard difficulty, and narrated cutscenes explain the plot between missions. All of the in-game cutscenes are narrated by Glorfindel, Elf-lord of Rivendell, who partakes in the game's epilogue. A narrative cinematic at the opening of the campaign tells the story of the kingdom of Arnor in the Third Age of Middle-earth. Even though Middle-earth was at peace for a thousand years following the defeat of Sauron in the War of the Last Alliance, the northern twin of Gondor, Arnor, is split into three realms owing to civil dissension. These three realms are Rhudaur, the smallest and weakest of the Dúnedain realms, Cardolan, the guardian of the ancient Barrow-Downs, and Arthedain, the largest and most populous of the three where the heirs of Isildur still reigned. During this time, the Witch-king appeared in Angmar, and sought the total destruction of the kingdom of Arnor. The campaign begins in the land of Angmar north of Arnor. Angmar in-game is a frozen, mountainous wasteland, and is home to many troll tribes of the north as well as the Black Númenóreans. The Witch-king realizes that he needs a symbol to unite the denizens of Angmar before he can begin his conquest of Arnor, and sets out to re-construct a citadel at the ruins of Carn Dûm. The Witch-king and his lieutenant Morgomir encounter a warrior troll, Rogash, and convince him to join their cause. The trio proceed to unite the Black Númenórean inhabitants as well as the Snow and Hill trolls, and defeat an army of Black Númenóreans that had been sent to defeat them. This finally unites the inhabitants of Angmar, and the Witch-king proceeds to launch an invasion of the smallest of Arnor's three successor states, Rhudaur. The king of Arnor, Argeleb I, has reclaimed his right to rule the entirety of the kingdom, and has sent his forces into Rhudaur to crush resistance to his rule. Seeing an opportunity in the king's presence, the Witch-king sends his own forces into Rhudaur and manages to save the Hill-chief, Hwaldar, from the men of Arnor. After defeating Arnor's army and slaying King Argeleb, the Witch-king conquers the hillmen of Rhudaur and uses them as troops for his growing armies. The son of the king, Arveleg I, has maintained a frontier along the Weather Hills for many years following the death of his father. Using the palantír of Amon Sûl, Arveleg has successfully foiled every attack that Angmar has made against Arnor. The Witch-king realizes that to destroy Arnor's defences, he must launch a direct assault on the fortress of Amon Sûl. Diversionary attacks against Arthedain's allies of Cardolan and the Elves draw off their forces, while the main force moves against the watch-tower. After a fierce battle, the tower of Amon Sûl is destroyed and Arnor's bastion lost. The palantír is carried by a retreating Arveleg I, however, and Morgomir is dispatched to retrieve it. The forces of Angmar catch up with the fleeing King on the North Downs, and he decides to sacrifice himself and the palantír so that the Witch-king cannot gain use of it. When another army from Angmar arrives, a battle ensues between a fort of Arnor's and Angmar's reinforcements over control of the shards of the palantír. Angmar is victorious against Arnor's forces, and Morgomir collects the shards for the Witch-king. The army of Cardolan was not crippled by Angmar's offensive at Amon Sûl, and therefore the Witch-king cannot commit to any further invasions of Arthedain with an enemy free to strike his armies' rear. The Barrow-Downs are chosen as the site of an offensive against the remainder of Cardolan's army, because the Dúnedain revere it as sacred ground that they would not allow a foe to desecrate. This way, Cardolan's forces are drawn into battle on ground of the Witch-king's choosing, and its forces are utterly destroyed. However, before Angmar can press its advantage against Arthedain, an offensive composed of Elves from Lindon, Rivendell, and Lothlórien is sent against its capital of Carn Dûm. Despite taking severe losses, the forces of Angmar manage to defend their fortress against the Elves long enough for reinforcements to arrive to lift the siege. The Elves are defeated, although enough damage has been done to Angmar to allow Arnor enough time to recover from its wounds unless action is taken. To prevent Arnor's resurgence, the Witch-king devises a plan that will inflict grievous harm upon the kingdom so that it does not defeat Angmar in its own weakness. The armies of Angmar once more descend upon the Barrow-Downs, and fell sorcerers of the Black Númenóreans create a plague that ravages Arnor, crippling its already fragile defences. Many decades after this plague has all but depopulated what was left of Arnor, the only city that still stands in defiance of Angmar is Arnor's capital of Fornost. The Dúnedain are prepared to make a final stand in the face of the Witch-king's onslaught, and gather all of their might and called on their allies, including a band of hobbits from the Shire. The battle is fiercely fought, but in the end the city of Fornost falls to the Witch-king and his army, and the kingdom of Arnor is utterly destroyed, concluding the campaign. The game received favorable reviews from critics. On the review aggregator GameRankings, the game had an average score of 78% based on 25 reviews. On Metacritic, the game had an average score of 78 out of 100, based on 22 reviews. NZGamer.com gave the expansion an 8.0 out of 10, crediting the games improvement of many aspects over the original Battle for Middle-Earth, as well as the games campaign for its use of a lesser known part of Middle-earth's history. ^ "The Rise of the Witch-king Campaign Guide". Gamereplays.org. Retrieved 28 November 2013. ^ "The Lord of the Rings: The Battle for Middle-earth II: The Rise of the Witch-king Reviews". GameRankings. Retrieved 2008-03-07. ^ "The Lord of the Rings: The Battle for Middle-earth II: The Rise of the Witch-king, The (pc: 2006): Reviews". Metacritic. Retrieved 2008-03-07. ^ Clark, Tristan. "LOTR: Battle For Middle-earth II, The Rise Of The Witch King". NZGamer.com. Retrieved 28 November 2013. This page was last edited on 28 March 2019, at 21:39 (UTC).